I can’t recall many Venezuelan’s who have worn the white of Swansea City but there is one whom I will never forget – Giovanni Savarese. As the Swans struggled in Nationwide League Division Two, John Hollins pulled a right old rabbit out of the hat when he signed Venezuelan international striker Savarese in October 2000 from MLS side San Jose Earthquakes. He arrived from the states with an impressive goalscoring record – having scoring 44 goals for the NY/NJ MetroStars – and it didn’t take him long to open his account with the Swans, as he bagged a brace on his Swans debut in a 2-1 win at the Vetch against promotion chasing Stoke City on a typically wet October day. There was never a dull moment during the South American’s stay in Wales’ answer to Monaco however. The highlight was probably his hat-trick in the 5-3 defeat at Luton in February 2001 – a rare feat for a Swansea striker during that time. 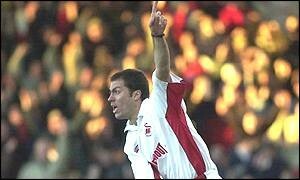 Savarese even managed to find himself concussed in the first half of a thumping 3 nil defeat at Bury in March 2001. Although many Jacks will no doubt remember his sending off after just 8 minutes in the Welsh Premier Cup Final against Wrexham at the Vetch as the low point of his stay. The Swans eventually lost 2 nil with a certain Lee Trundle on the scoresheet for the Robins that evening. Sadly Savarese’s spell at the Swans was to last only the one season, as he sought a new challenge with Millwall when the Swans were relegated at the end of the season. However, his tally of 13 goals in 35 appearances – a decent return for striker in a relegated side – meant that he would always be fondly remembered by Swans fans of that era. Given the interest in the Swans from the US this season, Savarese has found himself being intereviewed about his time in South Wales on numerous occassions. There is little doubt that his daughter being born in these parts – during his short stint in Wales – also has a lot to do with it. Savarese is currently head coach of New York Cosmos who play in the North American Soccer League – the same club whom Giorgio Chinaglia, once of Swansea Town, played for.